Truth by Kbaig: Pakistan will remain... There is no need to worry for propaganda against Pakistan! Pakistan will remain... There is no need to worry for propaganda against Pakistan! Our new generation when reads and listens analyses by enemies that ‘Pakistan is besieged by racial, provincial, sectarian and bilingual disputes. This country is going to be bankrupt, religious extremists are going to capture it, its integrity and stability’. At this point hopelessness overcomes them, they get worried, they not only feel insecure for country but for their and their children’s future as well. In such state of hopelessness they get seduced in the hands of enemies and join Taliban or join some other criminal activities and start revenge from their own fellow country men. Enemy sometimes uses them as fuel for bilingual disputes and sometimes in the sectarian disorders. However in spite of conspiracies of enemy and his poisonous propaganda if Pakistan is still stable then let us know that it is due to Allah’s help and support. Enemies propaganda in spite of all its effectiveness, neither have been able to do anything wrong in the past to the base of our country “Two Nation Theory” nor this weapon can be used by enemies in future. At such occasions some people give the example of separation of East Pakistan in 1971 at which Indra Gandhi raised the slogan, “We have drowned Two Nation Theory in Bay of Bengal”. But time proved production of Hindu and Brahman’s discrimination, today’s is not only limited to Muslims of Sub-Continent but inhibitors of India Sikh, Christian and lower caste Hindus take it as guiding star for them. They feel sorrow that they had understood this broad theory in 1940, that slavery of English is better than slavery of Hindu Brahmans. And has Bangladesh become part of India? By changing Bengal’s identity Indian rulers were day dreaming of Great India. Now if there are 17 movements of freedom within India although they are not supported by pro-Indian Western media. But source of all of these movements is freedom movement of Muslims of Sub-Continent for Pakistan. It is due to this (Muslim) movement that in India from ‘Tamil Nado” to east Bengal all coastal provinces and moreover people of far areas like Assam and Nagaland are not ready to be identified as Hindus. They are of the view, “neither their way of living is like central or western Hindus nor food and dress. They are as much different from Hindus as other minorities. And they are not minority as their population is 67% of total Indian population. In spite of this Hindu Brahmans have enslaved them”. Let us come back to our topic. Have a look at 62 years before on the propaganda of pro-Hindu western media against newly born Pakistan. After this our readers can understand that after all, what is the cause that there is not even a minor change in the stance of enemy. Even today their target is Pakistan. “In the rugged hills near Pakistan’s northern border last week turbaned Moslem tribesmen, fought pitched battles with regular Indian army troops. 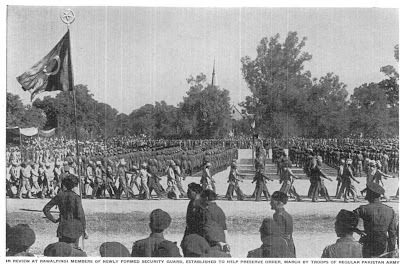 Across the new Moslem nation trains pounded over the rickety railroads collecting arms and volunteers (below) for the tribal raids into the neighboring state of Kashmir. 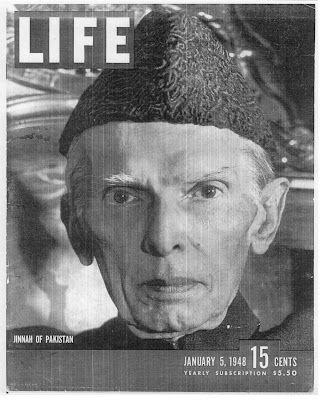 The Moslem League newspaper Dawn referred to the raiders in Kashmir as the “Liberation Army” and New Delhi announcements as “enemy communiques.” Yet in the Pakistan capital at Karachi the country’s creator-dictator, Mohamed Ali Jinnah (see cover), calmly insisted that it was none of his doing. This seemed a strange claim when daily reports told of frequent Pakistani casualties and when Jinnah himself publicly denounced Kashmir’s ruling prince for putting a predominantly Moslem State under Hindu India’s protection. 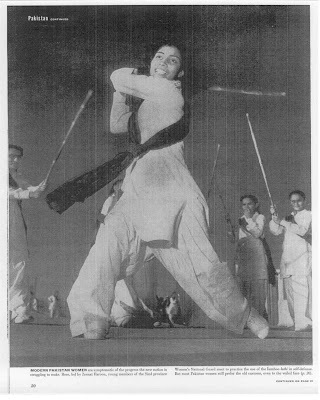 But what it meant was simple enough—Jinnah still had no real national program for Pakistan except the incitation of fanatic Moslem zeal. 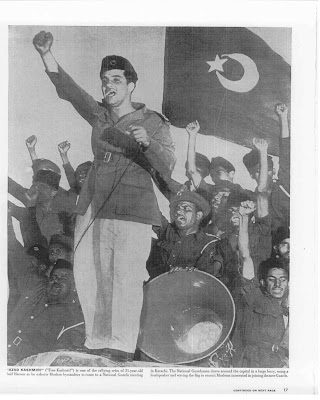 If this led some of his 70 million followers to rush off to war and the rest to rally through the cities crying, “Free Kashmir!” (opposite), the Qaid-e-Azam (Great Leader) could not help it. There had to be some outlet for whipped-up Moslem emotions, and occasional army reviews and establishment of internal Security Guards (above) was hardly enough. Yet Pakistan dared not risk and could not sustain a substantial military operation. 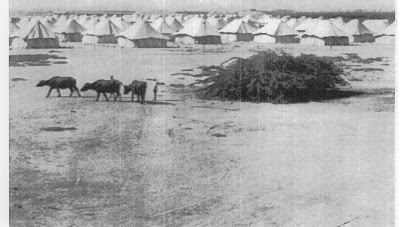 In the division of British India, Pakistan got a regular army which now numbers some 150,000 men, but Hindu India got even more troops and almost all the ordnance factories and most of the ammunition stores. Provoking India into full-fledged hostilities might mean national suicide. The Kashmir fighting was only the natural outgrowth of Jinnah’s bitter seven-year campaign to force the Moslems and the Hindus apart. Now that he had signally succeeded, Jinnah seemed to have little or no realization of the frightful economic consequences his Infant country faced. For the most part lie remained in absolute seclusion, emerging only occasionally to denounce the villainous Hindu for all of Pakistan’s many ills. You have read extremely painful excerpt from first page of weekly “Life”. The rest of this article is also full of propaganda emphasizing grave economical, food shortage, and educational problems. This means western media was sure that within two or three years Pakistan will beg to India to make it its part. But seeing the passion for independence of Kashmir they got shocked. They cannot imagine that a new born state having an army without weapons have forced Indian army to lick the dust. Perhaps that is why in order to hide their mental confusion they have claimed Qaid-e-Azam as ‘Dictator’ and have accused him for spreading religious fundamentalism. If this had been modern era, western media had declared him as terrorist from UNO.